Posted in cakes and tagged beetle, birthday cake, bug, car, vw. Bookmark the permalink. Posted in cakes and tagged ballet, birthday cake, bows, flowers, girls, kitty, pink. Bookmark the permalink. This cake I loved. It is a chocolate cake with chocolate chip hazelnut filling. 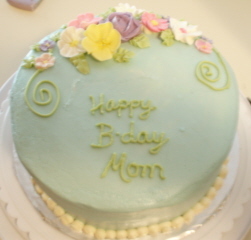 It is iced in buttercream and has a mixture of buttercream and royal icing flowers. Posted in cakes and tagged birthday cake, cake, chocolate, flowers. Bookmark the permalink.